If you’re lucky enough to live in a state like Arizona where ATV’s and Side X Sides have access to public roads and you’re trying to find some DOT (Department of Transportation) approved ATV tires to finish your quest to be street legal…well here you go. This is a list of all the current models of ATV & UTV tires that are street legal. This tire is a DOT approved 8 ply radial tire that’s designed for the UTV market. It is available in 26 & 28 inch sizes that will fit a lot of ATV’s, but they’re 10 inch wide tires, so look at your current setup and see if you have the room to clear an extra 1-2 inches around the controls & suspension. These are available for 12, 14 & 15 inch wheels. This is a DOT approved 4 ply tire designed for the 2WD sport quad market. Very nice design for heavy road use, not designed for extreme off-road and trail riding. This is a moderately aggressive (tread pattern) DOT approved 8 ply radial ATV/UTV tire. Currently only available in 26 inch for 14 & 15 inch wheels. This model has a consistent center lug pattern that provides a smooth ride while riding on roads and an aggressive outside lug pattern to enhance off-road performance. The lugs are 1 inch tall, which is a very aggressive height considering its purpose. This DOT rated tire comes in a lot of sizes. You will not have a problem finding a size to fit any ATV or UTV. Both the ATR & XTR are 6 ply radials. The ATR comes with ¾ inch tread depth and the XTR has a 1 1/8 tread depth. The tread design is slightly on the aggressive side and was intended for more off-road use then on-road. Some users commented in their feedback that the tire composition is on the soft side and can show premature wear under heavy on-road use. 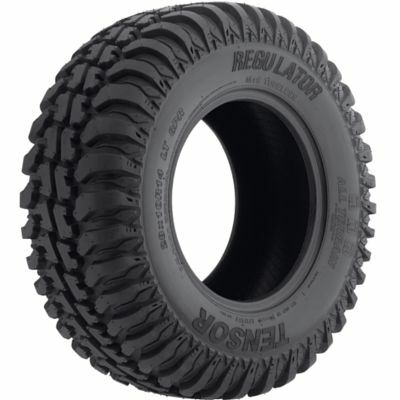 This is a new tire from Tensor Tire called the The Regulator A/T. Currently it comes in 28x10R12, 28x10R14, 30x10R14 and 30x10R15. It features an 8-ply radial construction and has made a great first impression with riders because of the awesome grip and quietness when run on hard surfaces.